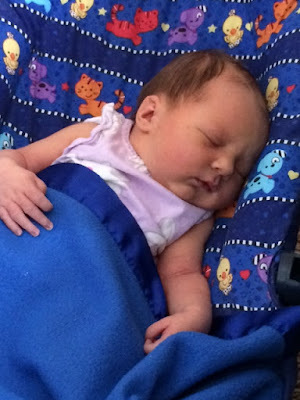 The biggest and best news of the month--the arrival of Makenna Claire Hosfelt! Our fourteenth grandchild. Mother and baby are doing great. We can't wait to see and hold her when we come for Janae's wedding. While it is summer back home, the children here are back in school and temperatures are beginning to cool down. It is monsoon season from now until September. We purchased rain jackets and umbrellas thinking monsoon season would bring more rain. Not so, it is mainly a change in the direction of the wind and a lot of the days there is a strong wind blowing. When it does rain, it is a quick intense rain storm. These storms usually occur in the evening. In June we said good bye to the office Elders who so patiently taught us our duties and whom we grew to love. Elder Saroha who trained Elder Bedke returned to Delhi (pictured right) and Elder Penugula, who trained me, is the shortest of the 4 Elders pictured below. Elder Penugula will be attending BYU-Idaho winter semester so we hope to see him in the States. Included in this photo of departing missionaries are two of the Assistants we enjoyed working with and grew to love. Elder Willis is the tall one in the center and Elder Stephen is to the right. This is preparation day (better known as P-day) and the Bangalore zone all gathered together at our church building for a game of basketball. This was a farewell event for Elder Magalei, who had to return to the USA due to visa problems. Jeff joined them long enough to make a very amazing no look, behind the back, 3 point shot that the Elders are still talking about. Too bad no one got a picture of it. We were invited on a Saturday to visit Brother Kumar and his family. They have 2 girls and the other 2 children are cousins that were visiting. They are a very friendly active family of our Branch. He was recently released from the Branch Presidency. This is Swapna with her husband and 3 teenage children. Swapna is the cook and maid for the Jackson family and we have had the opportunity to eat some of the delicious dishes that she makes--chicken enchiladas with homemade tortillas, potato soup, breads, carrot cake, lasagna, etc. Swapna and her family have done some reading in the Book of Mormon and have attended our Sacrament Meeting. We enjoyed a Sunday evening visit with them in their home. These are some of the children in our church Primary. They are so cute and I am lucky enough to play the piano for them in their meeting. I love to see the little girls' dresses each week. They are always so beautiful and colorful. The Sam Jackson family--Sam and wife Carmen with children William, Ainsley and Sammy. Sam grew up in our neighborhood in Sandy and so we know and love his family, The Jacksons have been so kind to us and especially helpful in our adjustment to India. He is working for Target and will be here for a couple of years. We love them! Well there was excitement and anticipation among the Bangalore missionaries as they waited for the opening of Burger King in a nearby mall. But of course there were no beef burgers--just chicken, mutton, or veggie Whoppers. Not any place we will be eating. However, here is a real T-bone beef steak that Jeff got in celebration of Father's Day. I had salmon that was very good. We went to a restaurant on a nice European looking street with the Jacksons, the Bairs (another young couple from USA here for work) and Brother Bradley who is also from the States and here until October. His wife joined him a few weeks ago and is helping us out in the mission office. Outside of our apartment complex they give karate or whatever they call it here instruction once or twice a week to the children. We went with President and Sister Berrett on a P-day a few weekends ago to Mysore. It was about a 3 hour drive to get there where we toured a palace. It was a nice break for us all and a much needed break for the Berretts. On the way back to Bangalore we stopped by some waterfalls. This is like the river run ride at Disneyland where they go up and spin around under the Falls. You will notice that none of them are wearing swimming suits. The just go in the water fully clothed. We saw this lizard type creature perched on a rock and also lots of monkeys running around. There was a boy eating a mango and one of the monkeys started racing towards him. His mother yelled "toss the mango" and that monkey immediately snatched it up and started eating. As mentioned above, we will be home for our daughter, Janae's wedding in August. She will be married to Kyle Hardy on the 13th of August. I guess she took me seriously, when I said that I would arrange her marriage with an Indian if she was still looking for a husband by the end of our mission. We are very happy she found Kyle and we look forward to him joining the family. There is still not a lot of other missionary news. Just more bills, apartment management, and getting everyone registered. We look forward to seeing many of you next month!